It’s that time of year again! Time for seasonal cleaning. Whether doing a complete overhaul of the house or just a little more cleaning than usual it can be hard on your skin, respiratory system and the environment using all those chemical based cleaning products. Why not try something a little more eco-friendly this year. You can still achieve the same deep clean as you did with traditional cleaning but you’ll also be doing your part to preserve our ecosystems. You can purchase certified green cleaning products from the grocery store or hardware store. When looking for non-toxic cleaning alternatives in eco-friendly products read the labels. Make sure the cleaning supplies are marked with a Green Seal or Eco-logo. Using certified green cleaning products around the house are not only better for the environment but also better for you and your family. There are lots of options out there now for green products including all-purpose cleaner, toilet cleaner, carpet cleaner, laundry detergent and dish soap. Take a look next time you’re at the store. Pick up one at a time as you use up your other cleaners and before you know it you’ll have replaced all your old chemical cleaners. It’s easy to make your own eco cleaning products. In fact you probably already have many of the ingredients needed already. Vinegar has been used as a cleaning product for decades. Vinegar is naturally acidic and can be used to remove dirt and grime on most of your household surfaces. Baking soda is another great “found around the home” cleaner. It cleans, deodorizes, polishes and can be used as a stain remover. Salt is also a great abrasive for cleaning pots and pans. The best thing about do-it-yourself cleaning products is that you don’t have to spend a lot of money. There are many other organic or readily available, chemical free cleaners that you can use around the house. Like vinegar and salt you may also have them laying around the house already too. Look online to find other solutions to you cleaning needs. Don’t be daunted by your big clean this season. It seems like a lot of work before you start but once you’ve finished you’ll feel great about your home. 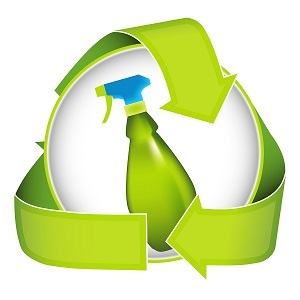 Using eco cleaning products is another way to feel good about what you’ve done – you’ll be helping the environment too.